The world around us is changing at a much faster pace than any one can anticipate. The world of “computing” has already seen great shifts from Desktops to Notebooks to Smartphones and Tablets. The coming decade will be more focused on mobile computing and cloud computing. Here in this article, I am listing some of the best and really useful applications released in Android market (aka Google Play), that comes handy for any one who is working in Electrical and Electronics industries/professions. ElectroDroid – is the most popular and useful application in Android market for an electronics engineer. 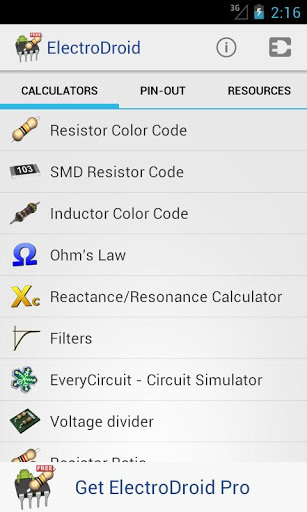 This app is a collection of many simple and useful tools like Resistor color code calculator, Filter value calculator, Inductor color code calculator, SMD resistor code calculator, LED resistor calculator etc. The App also has a great collection of pin out diagrams of USB port, Parallel port, Ethernet port, VGA connector, Firewire connector etc and other resources and references which lists PIC micro controller database, ISP specs of AVR and PIC, Circuit schematic symbol reference, ASCII table references, Battery references etc. This application has been downloaded by more than 10,000,00 smart phone devices and has been rated by more than 30,000 users. If you are looking for a much better version of the app without ads, you can buy it from the Google Play store (Electrodroid Pro) for less than 3 USD. EveryCircuit – is a simple and beautiful application for android which helps you to build and simulate circuit ideas. It has a really good & simple user interface which begins with a workspace where you can start building your circuits. You can add your components like resistors, capacitors, inductors, power sources, signal sources etc and wire them together to complete the circuit. You can alter the values of each and every component and then finally Run/Simulate them. You will see the current flow, input and output waveforms graphically represented etc when you run the circuit you have built. You can alter the component values in real time and see the changes in output instantly. 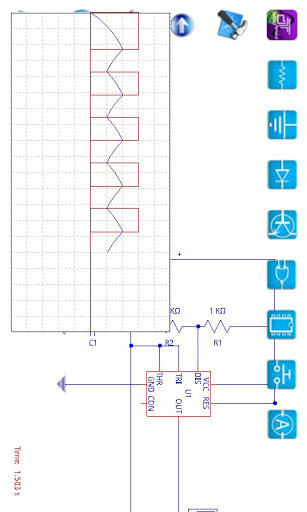 Additionally the app developers have provided a set of built in circuit applications like inverting amplifier, rectifier circuits, voltage regulator etc which the user can simulate instantly to learn the working of these circuits. The attractive feature is the graphical representation (animation) of the electron flow, input and output signals which helps the user to understand the circuit functioning within no time. Their free version doesn’t have a large work space area, which limits the number of components you can play with. They also have limited their component library in their free application. I think they have deliberately done this to promote their paid application – EveryCircuit Premium – which they sell for around 10 USD. They have sold more than 10,000 apps in Play store, which shows people are quiet interested in their app. I suggest you try their Free app first and if you like it, go ahead and buy the premium version. 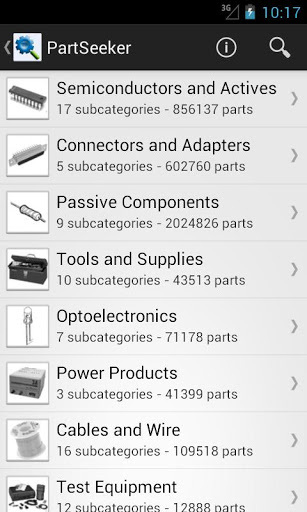 PartSeeker – is an app for searching electronic parts and components. Unfortunately this app is a paid one and the good side is that you can buy it for less than 2 USD. This app is made and released by the same company (IERO) which made ElectroDroid (see above) app. IERO has made this app by using the extensive component library of Octopart (the electronic component search engine). This app comes handy while you are away travelling and is keen to search for a component using your mobile device (may be smart phone or a tab!). PIC Microdatabase – another free app from IERO, which integrates well with ElectroDroid app. 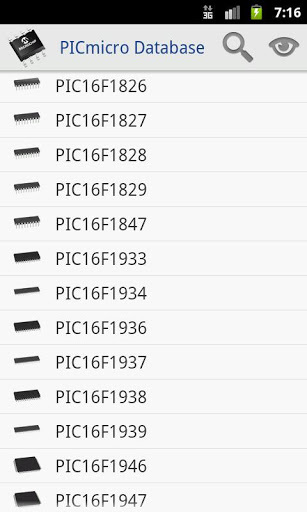 This app is nothing more than a database of PIC micro controllers manufactured by Microchip. This app lists all PIC and dsPIC family of controllers in an easy to use user interface. 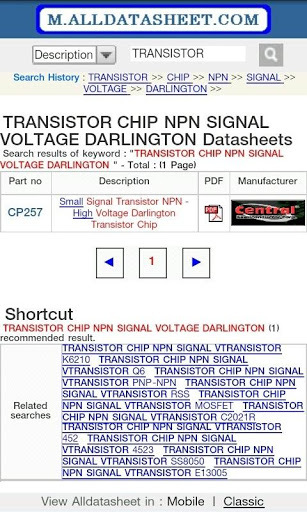 Features and specifications of all controllers along with pinout diagrams of select ones are available. The most attractive feature is a search functionality in which you can search for a controller with particular features you would like to have.As an example you can search for controller from PIC that belongs to a particular PIC family like PIC 10, with specific EPROM values, specific RAM, USB 2.0 or higher, specific internal oscillator values etc. The app will output all PIC controllers that matches your search criterias. So far more than 10,0000 users have downloaded this application. 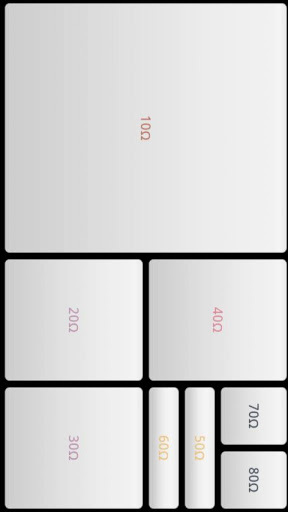 ElectronicsToolKit – is another free app which is a collection of simple tools like resistor color code calculator, series and parallel calculator etc. Almost all those tools are available in ElectroDroid app too, except for a Power Triangle calculator. I have listed this app here as it is free (and I have spent some time to download and test this app in my Galaxy) and you guys can try out, if you have time.More than 10,000 users have tried this application. 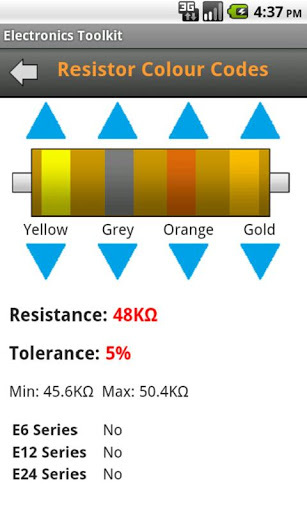 EquivalentResistanceSolver – is another free app which helps you to calculate the equivalent resistance of a circuit. This app may not be that useful for a professional as the “user interface” is average. It takes lots of time to build a “Series-Parallel” combination. Might be handy for students who are learning about the concepts for the first time. RF Pad Calculator – is a free app that helps to calculate the resistor values required to build an RF attenuator. 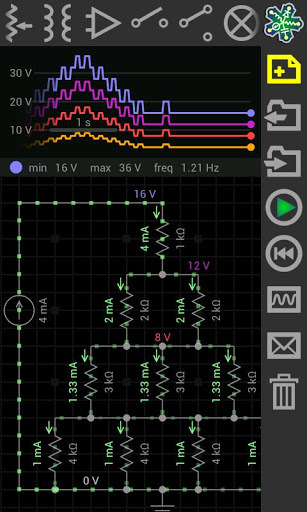 AmpliCalc – is a simple and free app to calculate inverting and non inverting operational amplifier values. FilterCalc – is another free app from the same developer of Amplicalc, which helps to realize filter design by finding the appropriate values. ControlCalc – is yet another free app from the same developer of Amplicalc, which helps in simulating closed and open systems, calculate transfer functions, state response & you can save the output as PNG. M32 Assembly – is another interesting application which helps you to learn assembly language by yourself. This app infact is a simulator for the M32 processor. Electronica – is another app which is open source (the source code of this app is available for free download). This app is also a collection of simple and easy to use tools that comes handy for an every day electronics enthusiast/professional or even a student. There are a handful of other free android applications like Ohms Law calculator, 555 Timer Calculator which I have not mentioned here. The reason is simple, most of the “electronics tools“ apps like ElectroDroid, Electronica, ElectronicsToolsKit etc has Ohms Law calculation, Resistor Colourcode calculation and 555 Timer calculator embedded in them! I have been using electrodroid app as it offers all the basics of electronics about resistors,capacitors,inductors,and here i got some other electronics apps list…have to try them…and also are there any software’s available for our computers..? where I find This type of PC/Computer applications ? Nice post Sir….Coz Im a E&TC Student and also a android user. Thanx…. can you tell me about any android application that uses bluetooth to control the electrical switches in our homes. and the circuit also. i want to build a bluetooth controlled switch board.